The Satsop Springs Rearing Facility operates through a cooperative agreement with the Washington State Department of Fish & Wildlife to raise and release rainbow trout, coho, Chinook, and chum. Each year we raise approximately 450,000 coho, 600,000 Chinook, and 450,000 chum, in conjunction with the Bingham Creek Hatchery. About 6,000 rainbow trout are raised at the Satsop Springs Rearing Facility, to be distributed to multiple lakes and ponds within Grays Harbor and Mason Counties. This stocking effort would not occur without the help of many dedicated volunteers. Trout planting is very labor intensive: fish are seined to corral them to one end of the pond, they are dip-netted from the pond and loaded into large oxygenated tanks on the back of trucks, and finally they are hauled to designated lakes and released. The fish average 4-5 pounds each for the early plants in March and April. As the season progresses, fish weighing 8 to 10 pounds each are planted. 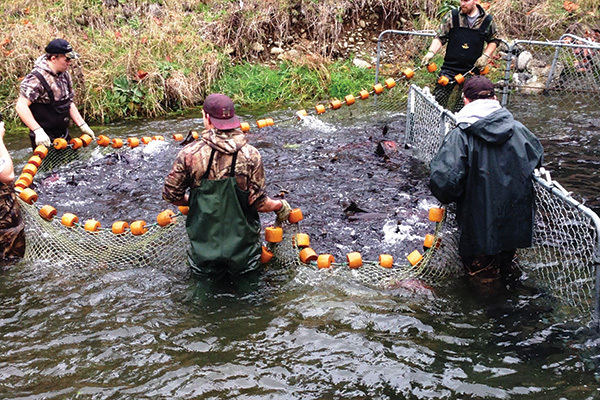 The mission of Chehalis Basin Fisheries Taskforce (CBFTF) is to produce salmon for sport and commercial fisheries; enhance steelhead and searun cutthroat trout resources; and restore, enhance, and protect stream habitat critical to these anadromous species. CBFTF is a non-profit organization dedicated to increasing salmonid populations for citizens and communities in the Chehalis River Basin.